The virtual currency bitcoin is not necessarily a novelty, but from time to time bitcoins applications have been getting a lot of attention. This type of currency came to light after the WannaCry program was revealed, a type of software that invades computers encrypts the information contained in it and asks for a financial value to return the information to the owners. Called ” ransomware”, WannaCry has gained a lot of acclaim for asking that the value be returned in bitcoins, even becoming prominent in TV news, raising awareness about this type of currency. 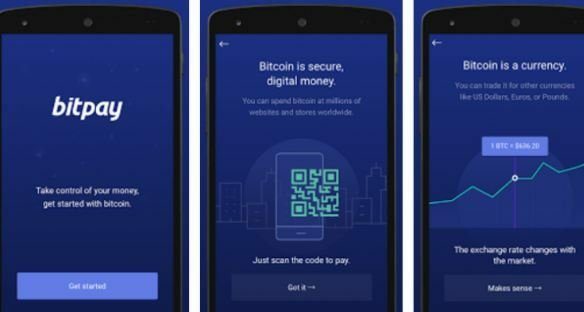 We’ve already reported on five of the key facts about bitcoins here on AppTuts, and this time we’ve shown 6 of the best bitcoin apps you can install on your phone and get to know the currency better. If you are looking for bitcoins to improve your income, be sure to visit and get to know the top 62 sites you can use to make money online every day! One of the biggest sites about bitcoins, BitPay also has application for Android or iPhone and iPad. Functioning as a “bitcoins wallet”, allowing you to use the application to make transfers, buy or sell currency and track the quote of bitcoins against other currencies. The application is free for any user and supports multiple languages. An alternative to BitPay, Gliph is also one of the complete bitcoins applications available for Android or iPhone. The app serves as a messenger, being able to talk to friends or form chat groups, but also counts on buying and selling items using the encrypted currency. As you use bitcoins, Gliph has more security options for your conversations, such as deleting a message from both your device, the recipient’s smartphone, and the app’s own servers. The third virtual wallet on our list with bitcoins apps is Xapo, which can also be downloaded for Android or iPhone. This application is also free and allows you to manage several types of currency, including making debit cards to use at ATMs around the world or making transfers through the application. Another of the most famous bitcoin tools, Blockchain facilitates the transfer and receipt of the coin, also counting on several other currencies. The app is free and has several tools for account security, such as 2-step verification and PIN protection. Blockchain can be used in over 25 languages and is available on both Android Play and AppStore on iPhone and iPad. Unlike the bitcoins applications are shown so far, Blockfolio is a tool for tracking the movement of the encrypted currency markets. The app is perfect for knowing the right time to buy or sell currencies and is indispensable for anyone who wants to dig deeper into the subject. The Blockfolio can be downloaded on Android devices and also on the iPhone. Of the apps on our list, Lawnmower is one of the ones with the most unusual proposal. Instead of requiring you to invest directly to acquire the bitcoins, it works with the “broken” values in your account. That is, it uses unlearned values, joins them and uses them to buy the coins as if it were a “piggy bank”, but digital. From the same blockchain producer, Lawnmower can be downloaded for free for Android or iPhone and iPad.